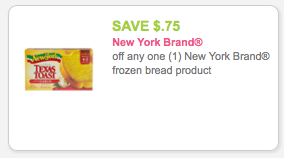 Rare $0.75 off any one New York Brand Frozen Product = $0.49-$0.50 at Price Chopper! $0.75 off any one New York Brand Frozen Product - click on "food category" to quickly locate the coupon, for me it was on the 5th page. *The $2 NEW York brand items are also part of Get $0.10 off per gallon When You Buy any 5 $2 Items, $0.20 off per gallon when you buy 10 and $0.30 off per gallon wyb 15 gas promo!